I’m a strong believer in the power of menu pricing. You create three different packages – three different options – that you then present to the customer to help increase your chance of an upsell. But how can you best present those options? One of the most powerful ways is the tick list technique. It’s simple. Visual. Powerful. Essentially it’s a simple as it sounds. You set out a table with your options on it. Across the top are the packages you offer. Bronze, silver and gold for example. Down the side you list all the things you do. Then, with a series of ticks and crosses you mark which services are part of that particular package and which aren’t. Although the ultimate aim is convincing the customer it’s also useful for you. It’s a great way to plan and structure your solutions when you are first designing what options go in each particular package. Try it with a flip chart and Post-It notes. Work out what your perfect combination will be. As I’ve said this is simple, visual stuff. But it’s powerful. Why? There’s several reasons but essentially it’s this. As humans and particularly as customers we hate missing out. We’re loss averse. 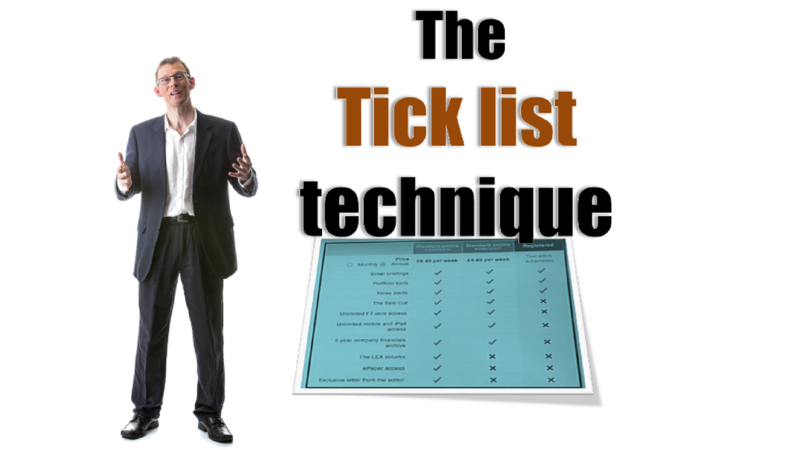 The tick list – with its big red crosses shows us what we are NOT getting. We see – quite clearly – what we are missing out on. So, by using the tick list technique we can, very simply and subtly persuade customers to instead go for the middle option or even the top, most expensive option rather than our basic level, cheapest packages. Our customers don’t want to miss out and we’ve achieved an upsell. I suggest you use the technique whenever you reveal all your solutions to a customer – whether that’s in a brochure or in a proposal during a meeting. Remember it works. And that’s one tick that you really want to see.